8. It is not, in fact, anything like silence, anything like stillness, anything like coming upon an empty meadow the day after a heavy snow storm, a meadow that is no longer a meadow but simply an expanse, a white expanse, wind in the bordering birch trees, leafless, nothing around but your own breathing, your own pause, nothing around but the moment you realize this pause. 9. It is not even like any mitten, any category of mittenness. 10. How small a hyphen is. How effortless its great work. Hawkey (like many other contemporary poets) is interested in the orality of poetry, specifically in the way that reading another’s poem inherently involves speaking it (even if silently) in the reader’s own voice and accent and patterns of speech. Thus, reading becomes an act of translation, reanimation, and, ultimately, ownership, opening the door for new modes of writing that will carry the intermingled DNA of two poets. As his strategies suggest, Hawkey is also intrigued with translation (in the broadest sense) as a creative act. He writes about a “willful mis-translation” as a way of pointing to the original and thus maintaining a kind of fidelity that is different than a literal or exact translation. The poems that result from Hawkey’s authorial bonding with Trakl are as varied as the strategies he uses to create them. Some (like Yellowtrakl, Bluetrakl, and Blacktrakl), which are poems built upon unrelated lines extracted from Trakl’s poems, read and sound much like Trakl, retaining a strong sense of mood and emotional ambiance. The sky hardens to grey over the yellow fields. Others, clearly made through word processing techniques, are less concrete and resemble textbook Surrealist poems (or the results of a slightly offbeat version of Mad Libs). Moan in the blue light of a lost miner’s eyes. 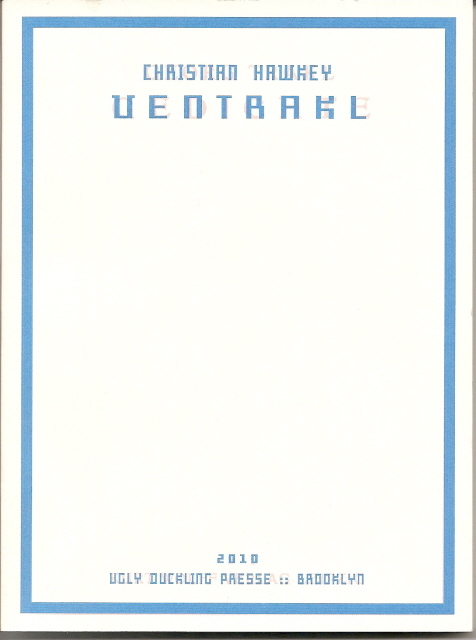 In addition to being a collection of poems, Ventrakl is a work that blends biography, history, literary discussion, quotation, and photographs, making Hawkey’s poetic enterprise a close parallel to W.G. 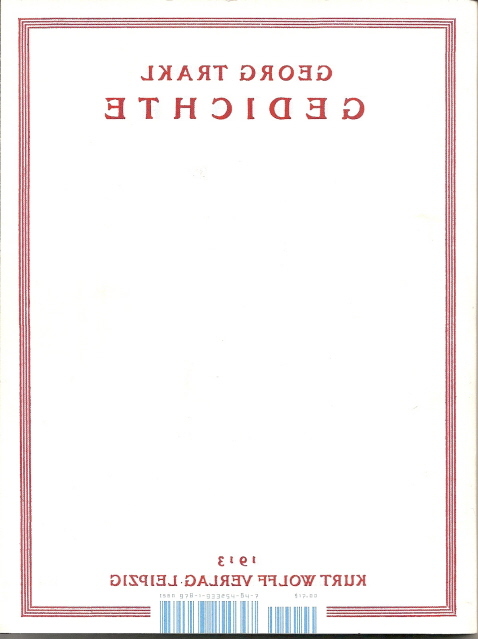 Sebald’s work in prose. In between poetic efforts, Hawkey pauses to provide biographical snippets, interpretations of a few of Trakl’s lines of poetry, and commentary on a number of photographs of Trakl. Hawkey treats photographs essentially like texts, as something that can be played with. What traces or traces of a life could I find there, translate there? Does one defer to the magic of the photograph, the weirdly doubled aura of the historical author portrait? Can one engage it actively, generatively, using writing and the visual editing and manipulation tools now packaged into all our writing technology (crop, rotate, enlarge) to either exaggerate its magic or dispel it? Both? I have to say that Hawkey seems less successful, less daring with photographs than with poems. He doesn’t seem on such confident ground with images and the results are almost trite. His immediate tendency is to provide a “reading” of a photograph as he encounters it, translating images into little stories, into the more familiar medium (for him) of words. 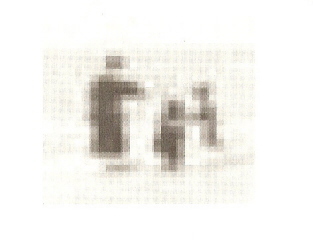 On several occasions, he does visually play with some of the images, enlarging them until they blur or simply break down into the building blocks of any printed image: squares of grayscale. None of this play transforms the images into anything remotely as interesting or successful as his poetic efforts. In a gesture of closure, Hawkey, who did not know any German when he began this project, ends the book with what seems to be the only complete translation of an entire Trakl poem in Ventrakl, Grodek. Grodek is a short, quietly terrifying poem about the scene of a battle between Russian and Austrian troops that Trakl experienced. Two months after witnessing the battle and its horrible aftermath (Trakl was serving in a nearby field hospital) Trakl committed suicide.